The idea of fishing a bead is to mimic a single dead egg that has come free from the gravel and is now being carried downstream. Large rainbow trout, char, whitefish, and other species feed on these protein packed snacks, but it is the steelhead angler that can benefit the most by learning how to fish beads. The majority of fishing beads are made of plastic with a few made of foam or soft rubber. They are similar to beads often found in craft stores with the exception that you need some sort of quality control. The hole needs to be bur free and the bead can’t have any cracks in it as this can cause nicks in your leader and lost fish. When fishing a bead the first thing the angler needs to do is pick the right color. Just like other lures this is often done by water conditions and clarity, but you must also keep in mind that this is to represent a spent egg. 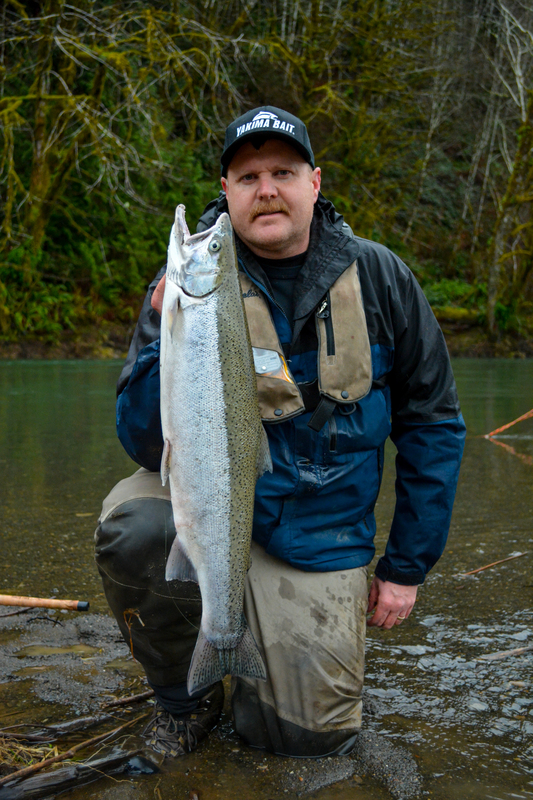 An example is when fishing after a Coho spawn beads need to match washed out Coho eggs. If this is done right after the spawn-from October through December-then a bright red or orange bead should be used. In January try using a pale orange, red, or pink as the egg died several weeks after it was deposited. Same thing with using a bead that represents a steelhead egg and use more orange, peach, and light pink colors. Good beads are often hand painted. This assures colors are as close to spent eggs as you can get and it also is a way to make sure the bead is not cracked and ready to be fished. Size is a big factor when it comes to fishing beads. Once again you need to think about what the bead represents. A Chinook egg in its late stages of incubation can be large especially once it dies and the membrane soaks in water. 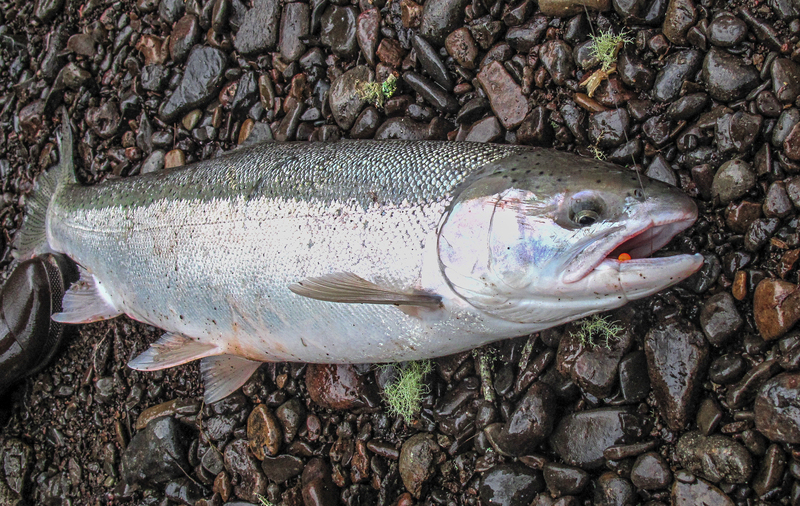 Use 12mm to 16mm beads when Chinook eggs are the food source. In Alaska where there are large Sockeye runs the most popular bead sizes are 6mm and 8mm since Sockeye eggs are one of the smallest, along with Pink salmon. For Coho and Steelhead egg imitations use a 10mm or 12mm bead. The hook makes a big difference. 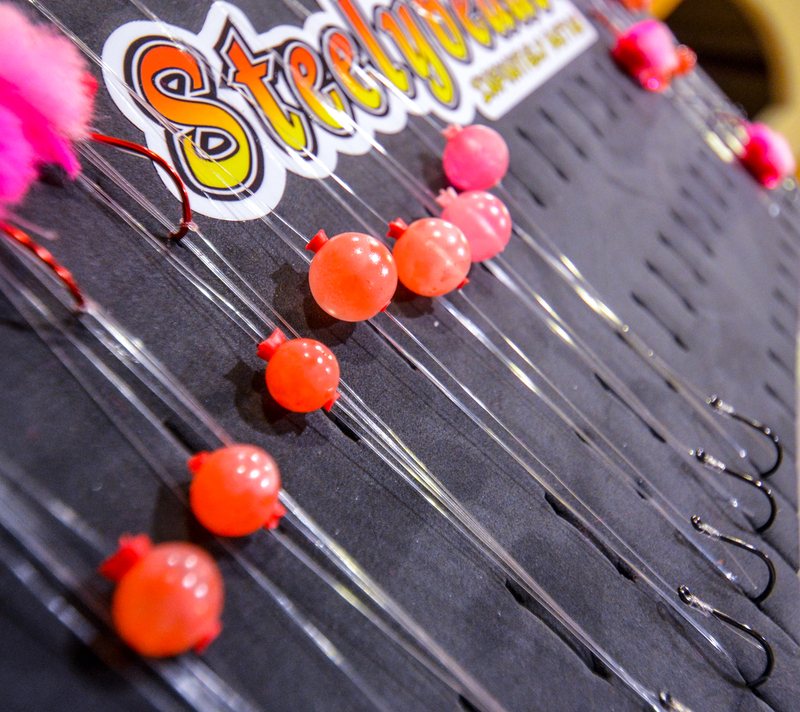 Pre-tying leaders with beads on them is not only efficient but allows you to switch easily until you find the size and color that is working for that day. But once you tie the leader you are stuck with that bead and hook combination so picking the right hook is very important. A wide-gap thin wire hook is more likely to stick into the fish’s jaw than a thick wire standard octopus style hook. Gamakatsu makes a line of wide-gap hooks that work perfectly with beads. If you look closely at an octopus style hook the tip is often slightly bent inward. The wide-gap has a straight point and the larger gap allows that point to extent outward. The thin wire not only looks like typical debris so it’s doesn’t draw attention but it also cuts faster and sticks easier in the tough jaw of a steelhead. When rigging the bead, pre-tie them on leaders with a hook size that matches the bead size. For smaller beads from 6mm to 10mm a size 2 hook won’t interfere with the bead and is the best size. Larger beads of 12mm to 16mm require a hook with a wider gap and a size 1 works well. Securing the bead, or “pinning it” to the leader, can be done several ways. The first is to use a “peg” which is often made of soft rubber and resembles a toothpick. Pull the peg through the bead until its tight and trim off the edges. This allows you to adjust the distance between the hook and the bead but they are prone of falling out. You can use a toothpick but be aware that this can cause the bead to crack and also damage your leader. One of the more popular ways to secure the bead is to use a rubber bobber stop. One below the bead allows you to adjust the length and one above keeps the bead from sliding up the leader, though some anglers opt to not use the top bobber stop as the bead is forced down the leader by the current of the river. If you are wondering why the bead is pegged a few inches from the hook it is because this allows the angler to use a hard plastic bead which look the most realistic to a washed out egg. When the fish bites the hard bead it lets go but the hook buries into the side of the fish’s mouth. If the hook was right next to the bead the hard plastic bead will obstruct the hook from securing in the fish and you will miss the bite. One benefit that the set-back hook has is that the fish is often hooked outside of its mouth and the mortality rate is reduced significantly. 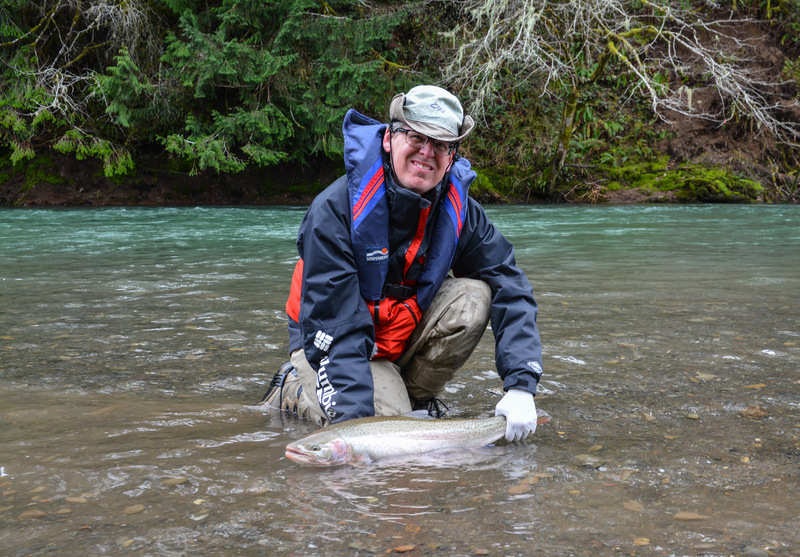 This is why fishing beads is a great technique when wild steelhead are in the river. Fishing the bead can be done alone or in tandem with other offerings such as yarnies or as a dropper from a jig. Simply tie the leader to the bend of the hook of the front lure/jig. Leaders for beads when used as a secondary lure should be long enough to have a separation, usually around thirty-six inches. 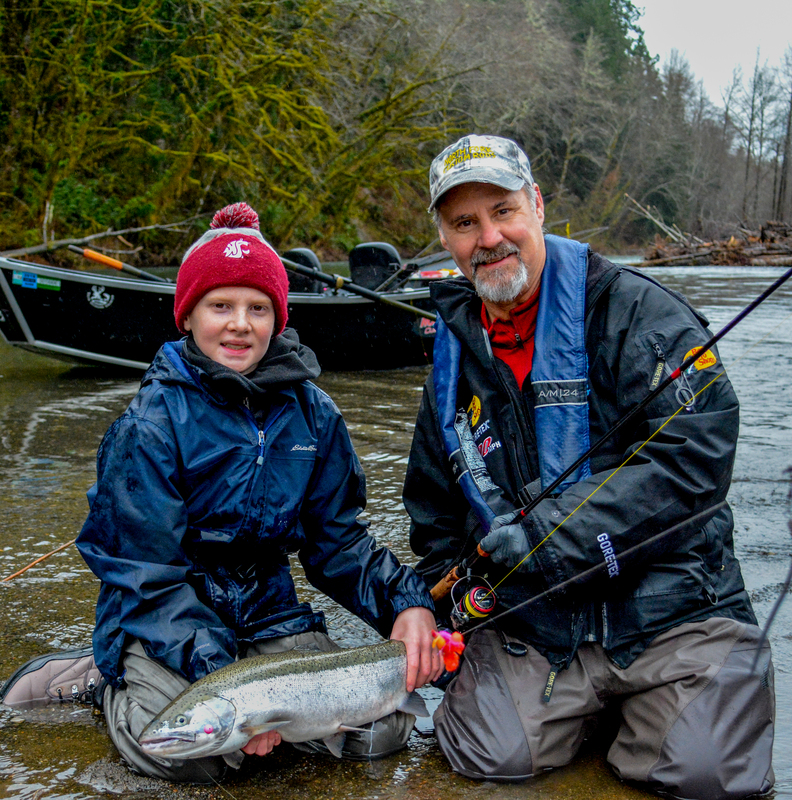 When fishing a yarnie or even drift fishing a corky or eggs a steelhead will often move over to grab the bait or lure and miss but a bead trailing behind gives you a second chance the the fish often grabs it quickly. Bobberodgging is a very popular technique and goes well with using beads, either alone or on a second leader. Be sure to check the regulations for the river you are fishing as some waters only allow one single point hook and the tandem set-up can’t be used. 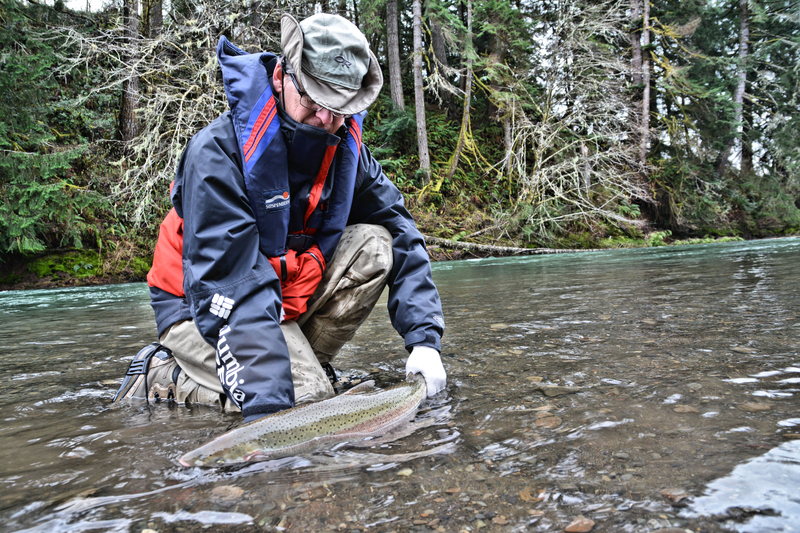 The versatility of fishing beads will help you catch more steelhead so give it a try the next time you hit the river.